What is the setting that gets your juices flowing? Is it a quiet, orderly space or do you require some sort of background noise? Maybe it’s soft music or nature sounds; perhaps an opera or even heavy metal. I need to have several different things going on in my studio space. It is an environment of sight and sound that engages me and encourages making disparate connections. I’ve come to realize this is what I am all about and what plays out in my artwork. My studio environment tends toward orderly disorder. Areas are designated for certain storage, projects, etc., but within that things are rather jumbled. When I’m searching for particular collage material, I generally need to empty a couple of shelves or a container to find it. In doing so, I pull out all sorts of items that I’ve forgotten about — and may offer a connection to a project I’m working on. Often, that odd item adds just the right energy or unexpected direction that makes the piece successful. The scraped paint from one piece is now incorporated in some other work. Even the backing to a medicinal adhesive pad is of value — its graphic design and texture will add just the right interest to a small piece I’m starting. My kind of music? Jazz. There is an expectation of improvisation in the genre that I seek when making my own work — my studio environment reflects and supports that. Large or small, designated or flexible, shape an environment that gets those creative juices flowing. Lynn Foskett was born in South Florida in 1949. She grew up and attended schools all over the U.S. and abroad. She earned a Bachelor of Fine Arts degree in painting from Northern Illinois University. 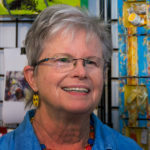 Since moving back to Florida, Pierson has been active in the Tampa Bay arts community. 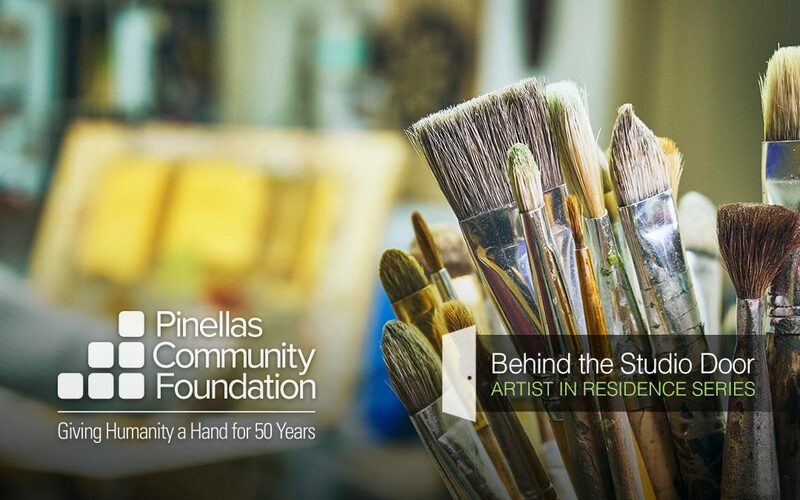 She currently serves as the Artist in Residence for Pinellas Community Foundation. ACT II: Behind the Studio Door – Where to Begin?